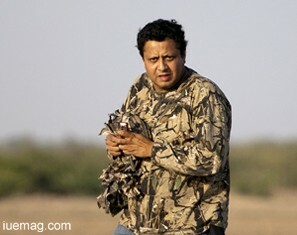 Diinesh Kumble is one of the finest Wildlife photographers in the country. He has published several books on photography and considers photography as a gift from mankind. His hugely popular 'Dream Safari' is an interesting account of Kumble's trips to Kenya and Tanzania. Let's know him better. How do you consider yourself as a person? DK: :) I guess I am very methodical in my approach; everything must be systematic and precise to the 'T', uncompromising! My mantra is when you take up something to do it thoroughly, give it your 100%, complete it and leave nothing unfinished. I may procrastinate but never shy of finishing it, whatever the task may be and however difficult it may seem. What motivates you to carry on wildlife photography? DK: I think the joy of being out there in the wilderness, just me, surrounded by nature, the surreal feel of the forest, and watching an animal in its natural habitat, going about its duties - simple albeit highly important from an ecological perspective is the best motivation that one can have. It is also the immense pleasure that I derive to see this activity come alive on my screen. If only this experience can be explained very simply, then this is it. Challenges! I am sure you've had many. What were some of them that make you feel proud after overcoming? DK: Wildlife Photography is challenging by itself - every time you enter a forest. Just capturing wildlife on your camera itself poses many challenges, especially, in India. So, every image is considered as a challenge overcome; there is never an easy one. But to elucidate, once in Gujarat, on the Vibrant Wildlife of Gujarat book project, we climbed up and down a steep hillock every single day for a few days in search of a Sloth Bear that was so elusive - the book would not have been complete without it. The bear appeared but briefly on the last day of our mission putting a smile on my face. Other challenges include capturing the picture of a charging elephant while ensuring that we don't get trampled over; photographing a python that was just a few inches away while lying on my belly half inside a cave; a pride of lions encircled our vehicle one late evening in Gir ensuring that we leave within the next few minutes; the challenge of photographing the Bengal Florican in Kaziranga National Park - after innumerable attempts I, finally, managed to get a decent photograph. In my dictionary this is perhaps the most difficult bird to photograph. DK: Yes, you can say I am spiritual, but not ritual. Just being in the midst of pristine forms of nature makes one spiritual I guess. It indicates your space in this world and the importance of ecological balance to keep the planet ticking. I attach my spirituality to my paternal grandfather who was the headmaster of a famous school in Bangalore. He taught Biology. I have never had the privilege of being his student as he had retired long back. But, I was exposed to his ideology which has left a great impression on me. He would undertake the ritual of bringing one flower from the house garden and placing it on the deity in the pooja room; he would bow his head in reverence for a minute, not more not less, and whenever he couldn't find a flower, he would bring a leaf and place it on the deity much to the chagrin of my grandmother who was more ritualistic in her attitude. When chastised, he would say, "What's the difference? They come from the same plant." This is spirituality to me - plain and simple. DK: I am currently working on a book project on the 'Nilgiri Mountain Railway', an UNESCO World Heritage Site. Although the photographs aren't mine, it really is a very interesting project. One of the main offerings of my company, Krab Media & Marketing is to publish coffee table books on various interesting subjects that India has on offer. Even though I may not be involved in the photography aspect of it, I still get to write the storyline, pick photographs from the best photographers, edit and bring a book out for everyone to enjoy. In this manner, we have over 9 titles published on various subjects and every one of them has my involvement in some form or the other. What were the moments that gave you immense happiness? DK: If you are referring to wildlife moments, then there are many. For instance, the mother elephant shepherding her calf against the current while crossing a dangerous river in Tanzania; a herd of elephants against the backdrop of the Kilimanjaro in Kenya; a huge flock of Greater Flamingos breeding in Gujarat - the only site in Asia where they breed; three Indian Fox pups cuddling against each other to beat a cold morning in Kutch - to cite a few. Traversing through the length and breadth of the Rann of Kutch; capturing those alluring moments that this wonderful district in Gujarat has while working on the Government commissioned book on Kutch - the artisans, the landscape, the wildlife, the people, getting a glimpse into their lifestyle, the food, and riding the ubiquitous 'Chakda'; everything about this project was sheer joy. But the highlight was most definitely when I met and interacted with Mr. Narendra Modi, now Prime Minister, but then the CM of Gujarat, who was also profound in his praise of our work on Kutch. Where do you see yourself in next few years? DK: I would like to consolidate my photography business to grow steadily. There is a lot to be learnt still, a lot to be explored, captured for posterity, write many more books of importance that will be appreciated, and a lot of knowledge and experience to be shared with people, students, and future citizens of this country, through workshops, lectures and seminars. From a personal accomplishment point of view - I would love to work on a commissioned National Geographic project. The interest and experience is there but the project has to be forthcoming. Did the engineer in you ever tried to stop you from following your dream? DK: Never, in fact it has probably helped me in many ways. When I first returned, like many others, I followed the path of a professional career by starting a software development company. Fortunately, I quickly shifted focus to what my passion was - photography - and now everything revolves around photography. The engineer in me helps me overcome difficult technical requirements that are essential to become a successful professional even in the photography space. It has also helped me understand, design and re-engineer gadgets that help in my area of work. Please tell us about the thought of pictorial books from recycled paper, from where did this thought ignite? DK: The idea of a pictorial book was kindled by my wife, Romila, after we were left wondering about what to do with a plethora of pictures that I had of African Wildlife. Before the book went for print, I was discussing the option of paper with my sponsor Hewlett Packard India (HP) when they suggested that we use recycled paper - and that left an indelible impression on the mind to use it more often than not, and conserve and preserve our greenery. How does your family, especially wife, contribute to your success story? DK: Like I said earlier, it was my wife who kindled this passion of putting together a coffee table book on African Wildlife. That began a journey into publishing coffee table books - the birth of Krab Media - and now with pride, I can say that we have published some outstanding books on various genres - from Sport, Wildlife, Travel, Photo Fiction to Guide Books. My wife accompanies me on almost all of my trips into the wild and on the photography stints. She and I travelled together extensively in Gujarat for both the books, covering the length and breadth of the state. She has been a source of inspiration and constant support throughout the ventures. Any facts, figures or references stated here are made by the author & don't reflect the endorsement of iU at all times unless otherwise drafted by official staff at iU. This article was first published here on 11th October 2014.